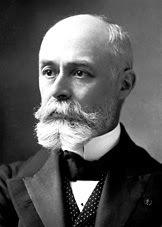 Inventor of radio activity Antoine Henri Becquerel was born in Paris in 1852. Good education, to a doctoral degree in 1888. In 1892 he became professor of physics practical at Museum of Natural History (Musee d 'Histoire Naturelle) in Paris. Interesting to note, both my grandfather and father were both not only physicists but also occupy the same position. Surprisingly, children do too. In 1895, Becquerel become professor of physics at the polytechnic college. (Ecole Polytechnique) in Paris. This is where in 1896 he made the great discovery that made his name famous. The year before Wilhelm Rontgen discovered X-rays, a discovery that shocked the scientific community. Memprodusir Rontgen X-ray tubes by using cathode rays, Becquerel wondered if X-rays are not be produced by the action of sunlight on the regular non-metal substance. Becquerel had some crystals in his laboratory "uranium potassium sulfate" - a mix of non-metallic he knows - and he decided to experiment with it: first, he put some thick black paper around the photographic sheets to make sure that no light can seemed to reach the sheet. Then he put the non-metallic crystals on the sheet that covered it and thrust it into the sun. Quite convincing when then can find photographic films, one shadow crystals appear on it. Becquerel initially convinced that he has found a new X-ray sources. Then, by chance, he discovered that a mixture of uranium will include radiation although it is not presented to the open light. Indeed, there are days where made Becquerel still vague and hesitant to repeat experiments as appropriate. Since he put his stuff - crystals and photographic sheet-wrapped and carefully - the way in the drawer, without first revealing the crystal in the sunlight. A few days later he nevertheless decided to wash the sheets photographic unused. She was surprised, it was revealed shadow sheet crystals! Clearly what is happening is not the usual non-metal. Becquerel wisely decided to undo the original project and replace it with the probe experienced a strange phenomenon. Soon he learns that the radiation will be passed by each chemical mixture of uranium is not the X-ray (For a while called the Becquerel rays). Becquerel found that a new type of radiation is passed by each chemical uranium and not only by what was first investigated. In fact, he found that although radioactive uranium metal. Since the radiation does not depend entirely on the chemical form of uranium, Becquerel realized that the radio was not from the chemical activity, but must of the uranium atom itself. In 1896 Becquerel published several scientific papers on the discovery of the phenomenon. Among the scientists who read the paper work to be interested and then an additional investigation was Marie Curie. He soon learned that the element of "thorium" also contains radioactive. In collaboration with her husband, Pierre, she also found two previously unknown, that "polonium" and "radium", both contain radioactive. (Incidentally Marie Curie was the first time using the term "radio activity" to explain the phenomenon). Other scientists, including Ernest Rutherford and Frederick Soddy, conducted an investigation of this phenomenon, and in a short time knowing that Becquerel rays contain three types of radiation. The scientists named it "alpha rays", "beta rays" and "gamma rays" and began studying the particulars third beam. The most interesting aspect of these rays is the energy terkandungnya. Radioactive substances clearly pass the energy in large quantities and it seems there is no other possibility than all of them coming from the inside of the atom. It teramatlah interesting, because prior to the discovery of radioactive grain of mustard was never assumed that atoms could contain so much energy. Becquerel the 1903 Nobel Prize for physics can jointly Pierre and Marie Curie. He died in 1908 in the town of Le Croisic, France. Radioactive it has significance for several reasons. First, it has various direct uses, such as treatment for cancer. Second, have great benefits for scientific investigation. Radioactive help us get information about the nuclear structure; instructions used in the investigation of radioactive biochemistry; retrieval radioactive time an important tool in the investigation of the geology and archeology. But the greatest significance because the exposure of the fact that a large amount of energy "stored" in the atom. Within fifty years since the discovery of Becquerel, discovered the technique to remove large quantities of atomic energy in a short time. (The bomb dropped on Hiroshima consists of uranium). Nuclear reactors, of course, presents a way of release of atomic energy in a more supervised and more slowly. Where is the position in the list of one hundred becquerel this character? Certainly not unreasonable to think that all these nuclear development is a Becquerel services. Because, there are many other people involved in this development. Nevertheless, the discovery of Becquerel is one radioactive embryo discoveries in science. Reality show, there are similarities between Becquerel and Leeuwenhoek. Just as Leeuwenhoek discovered microscopic life within one point of the water, as well as Becquerel discovered unexpected new world within the atom. Both found it by accident. However, it would not have happened if they had not done a serious investigation. As much as there are similarities between the two, it was clear Becquerel should be placed under Leeuwenhoek. Bacillus and the knowledge we have about them a greater role in human life than radioactive and atomic energy. On the other hand, I think Becquerel something more important than others (such as Enrico Fermi) are more directly involved in the fabrication of an atomic bomb. Prior to 1895, there is no theoretical view which suggests that this phenomenon is that there is radioactive. Once the key is known discoveries, discoveries in the field was a bit much can not be prevented anymore.